The Sedum genus of plants is a very broad group of perennial species that collectively are so tough and easy to grow that they are known as stonecrops, so-named because they are so often seen growing in rocky, barren areas. In addition to the species varieties, the stonecrops also contain some hybrids such as 'Autumn Joy,' now known officially as Hylotelephium 'Herbstfreude' (Autumn Joy), though it was formerly known as a sedum. As perennials, these plants are normally grown in the ground, but the right varieties of stonecrop are very easy to grow in containers, where their fleshy, succulent-like leave make your container designs truly unique. Stonecrops/sedums come in lots of different colors, sizes, and textures, and like succulents, they can withstand rough conditions and even extreme neglect. Stonecrops are the very definition of a drought-tolerant plant, which makes them ideal for growing in containers, where it can be especially difficult to maintain moisture levels. Sedums run the gamut—some are tall, some neatly mounding, and some are sprawling, trailing ground covers. The low-spreading to medium varieties look attractive in pots, and some of the larger varieties are striking when paired with blousy, soft grasses. While many of them will produce stunning flowers in the fall, almost all are worth planting for their foliage, which come in many different tones of green and blue-gray, and can turn gorgeous colors as the weather gets cold. Unlike most succulents, many stonecrops are extremely tolerant of cold weather and look great from spring through fall and into winter. Some are hardy in temperatures as low as minus-45 degrees Fahrenheit, even when exposed in pots during the winter. Stonecrops can look fantastic as a single plant in a mixed container. Given their range of habit, form and color, it may take some experimentation to find a mix you like, but you really can’t go wrong with almost any variety. When they flower, many stonecrops are excellent at attracting butterflies and hummingbirds. You can dress sedums up or dress them down— they can look great in very formal containers as well as in any rough-and-tumble repurposed container you may have. Try putting the low-growing ones in cement or hypertufa pots, or see if you like the way they look in troughs. Try experimenting by pairing your sedums with other succulents or mixing different types of sedums in the same pot. When planting stonecrops in containers, the only real essential rule is to use a well-draining soil—stonecrops that remain saturated in moisture may develop root rot and turn mushy. You can, in other words, choose just about any potting soil medium that works for other plants in the arrangement—from standard potting soil if the stonecrops will be combined with other herbaceous plants, or a cactus/succulent soil mix if they are being combined with succulent plants. But any soil you use will need to have adequate drainage. Make sure to choose a pot with ample drainage holes. Like succulents, sedums have roots which are pretty shallow, so they don’t need a huge pot to thrive. It's not a bad idea to add a slow release fertilizer into the potting soil, but there's no need to worry about supplemental feedings during the growing season. In fact, too much feeding can make the plants overly leggy. Stonecrops like full sun, but they will tolerate some shade. One of the beauties of gardening in containers is that the pots can be moved around to take advantage of shifting sun/shade patterns in the landscape. Raised above the ground, stonecrops in containers are more immune to some of the most common insect problems, such as slugs, snails, and soil nematodes. Scale, mealybugs, aphids, and weevils may still occasionally affect the plants; the best solution is often to simply wash the insects away with water. But these are tough plants, and few problems prove to be life-threatening. Since most sedums are very hardy (check your plant tag to find the hardiness zone), you can leave them outside if they are in a pot that can survive the ravages of winter. When the foliage dies in the late fall/winter, remove it and compost the leaves (discard any leaves that are diseased). Set the pot in a sheltered area for the winter—a shaded area next to a building is ideal. Some people imagine that putting the pots in the sun is a good idea, but this is actually counterproductive, since pots set in the sun may experience unseasonable thaw/freeze cycles all winter long, and this is devastating to the roots of perennial plants. It is much better for perennial plants to remain frozen for the winter rather than experience repeated thaw/freeze cycles, which has the effect of rupturing the root tissues. Pots that are heaped with snow all winter long often survive better than those that remain exposed to the air. 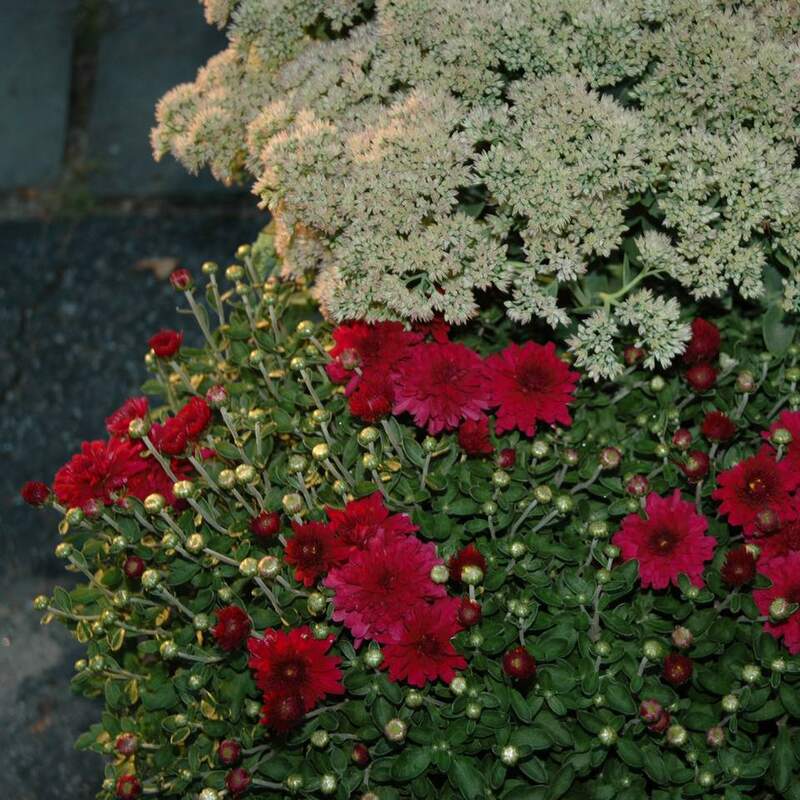 In any circumstance, be aware that plants overwintering in containers will experience extreme cold since they are exposed to cold air on all sides. If you are leaving the plant in its pot, make sure that it is rated for two USDA zones colder than the one where you live. If you live in zone 6, for example, choose species rated for zone 4. You can also protect them by wrapping the pots in burlap, and some gardeners even bury the pots entirely in the ground to protect the roots from temperature extremes for the winter, digging them back up in the spring.